So you missed the show did you? Arhhh…. sorry for you my friend! Don’t worry – the gallerist Anthony Xuereb was on hand to get some snaps so now you can live the whole experience through your computer screens in sober isolation. And peace out to the other Baylis Artists y’all! “In May 2011 the first Baylis Artists Beltane Show was held in Shoreditch Town Hall to critical and commercial success. 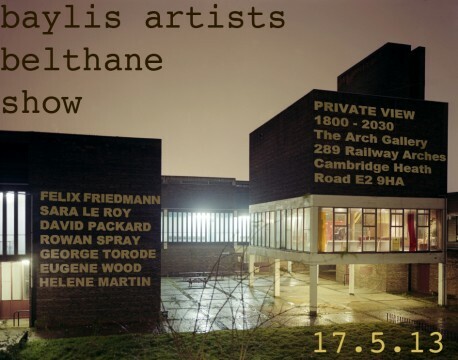 It drew together an exhibition of paintings and photographs from six contemporary artists, who were part of a subculture that lived and worked in the former Lilian Baylis School in Waterloo. The unique building is a classic example of modernist 1960’s architecture and provided the artists with large-scale studio spaces for many years. Since the first Beltane Show in 2011, the artists and residents of the Lilian Baylis School have all been evicted, making way for a multi million pound redevelopment of the site by Conran and Partners. It is currently a boarded up shell – on the cusp of being converted into 149 new homes.